Four layers, two of which — the Mother and Child and Magi — slip into slots in the side Manger walls, create a marvelous 3D effect. The rich embossing of the vintage original is beautifully evident in this Premium Download. "I have been browsing your website now and then, but your email got me there to see the new wonderful coloring pages. It got me, I may owe you a story, if the notion is every crèche has one. "I was born in Prague and lived there for 30 years. As far back as I remember there was a crèche under our Christmas tree. My aunt had one too and pretty one, but I liked ours better. When I was child my father took me on advent Sundays to different churches to see crèches. I grew and I wouldn't pass a church around Christmas without checking out what crèche is on the display. "When I was leaving Czechoslovakia, back then under the communist regime, I took only necessary things for a short trip. I did everything not to draw an attention to myself and slipped out on Christmas day in midnight train, in hope of softer scrutiny. It worked. It took some time to myself and my husband to get to US and start new life. "There were couple of things I wanted from the old country: My mother's recipes for her Christmas cookies and Czech Christmas bread, some of my fairy tale book collection, my old photographs and our family crèche. I did not get any. My mother died sooner than I could ask for it. There was nobody else willing to help just to mail my stuff to me. "Years later I found the recipes in Viennese cook book, the old snapshots lost their importance because the new ones become old very fast; and I got some Czech fairy tales from my husband's family. I did not hope ever even see my crèche. "I discovered Crèchemania.com about 2001, shortly after I got my first PC. I stumbled upon it by accident. I was looking for crèches, but under a different name like "Bethlehem," "paper Bethlehem," "printable nativity,"
"I was determined, if I won't get one I will make one out of parts. But it is not so easy. What I downloaded and printed from crèchemania looked better. My favorite is The Children Crèche, Post, and Rams, right after. I was happy to find something that well replaced my own crèche. 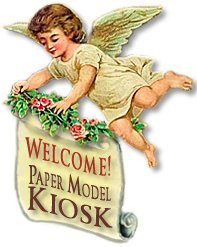 "To have a little paper crèche under the Christmas tree became important to me, especially after my daughter was born. I must say she likes it now, too. "Well, that would have been a nice enough end. Then one day I checked out what's new in Crèchemania and there it was—my old crèche staring at me from the web page! The Czechoslovakian Fold-out Nativity. I saw it first on the Milan Zabransky page: the same red, waxy paper, behind the window and the star, broken on mine, and replaced by a home-made one. "It is unbelievable there is one more like the one we had. It is a good warm feeling to pop in on crechemania.com an see it there on display. "I am very private person, and this little story is just a small thank you for all the crèches here. It is good just to look at them, like when I was little, walking with my father through Christmas-town. "Thanks, and Have a Wonderful Merry Christmas!" And there is one more happy ending.....downloaded and waiting for print! A Premium Download to print and assemble. 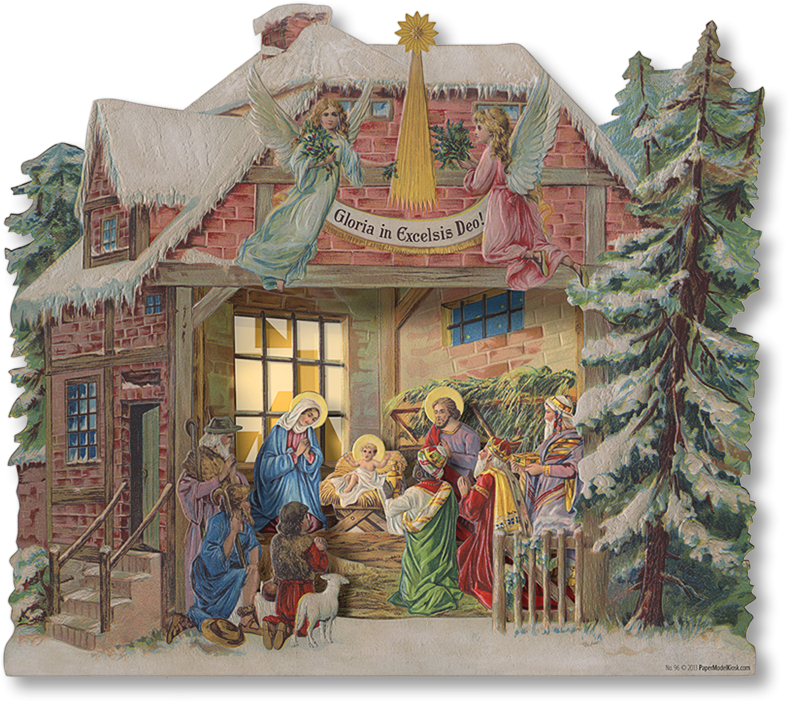 Two 8.5 x 11 sheets will create a four-layer fold-out paper nativity inspired by a vintage Czechoslovakian original in the Crèchemania Collection. Size: 8 x 7 x 1.5 inches. A vintage Pine Tree Nativity was recently sold on an auction site for $121.09. 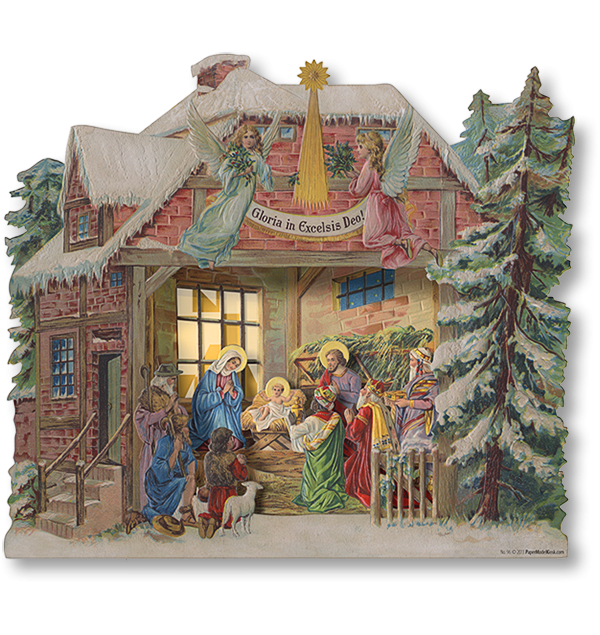 Buy Pine Tree Nativity as part of a collection, and save!